On October 4th, 1957, the Soviet Union launched Sputnik 1, the first artificial satellite, launching the space race. On the same day, the Jewish Odessa-born Soviet violinist David Oistrakh and his piano accompanist Vladimir Yampolsky arrived in rainy Beijing for a grand tour of the Chinese capital, Shanghai, and Tianjin. This was the golden height of Sino-Soviet relations — Soviet pianist Sviatoslav Richter (and his mezzo-soprano wife, Nina Dorliak) were already in Beijing, and young Chinese musicians interested in Western music rushed to these performances of these musical giants. 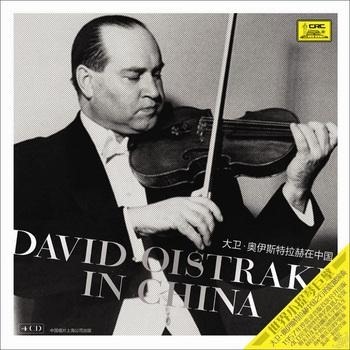 The official Chinese government recording company (CRC: 中国唱片总公司) quickly issued a set of eight LP “reference records” of Oistrakh’s performances in China, and they sold like hotcakes. Within a decade, at the height of the Chinese “Cultural Revolution,” those records would be destroyed as Soviets were denounced as revisionists and Western culture was forbidden. Now, somewhat against all expectations, these recordings have been recovered, and restored in a deluxe 4CD set. I just bought a copy of these CDs, while they are not the first recordings of Oistrakh that I might recommend, they are outstanding and a fine nostalgic look at what might be considered the twentieth century’s greatest violinist. Oistrakh’s tour was not without event (he was naturally upset when he learned that the Tupolev 104 he had flown in on crashed on its return flight to the Soviet Union, and he was “caught” listening to decadent Western jazz on Voice of America shortwave radio), it was a tremendous event that inspired an entire generation of Chinese musicians specializing in Western classical music. The Hong Kong-based South China Morning Post has an article reminiscing on Oistrakh’s tour. Sheila Melvin and Jindong Cai have a fascinating history of modern China and the effect of “classical music diplomacy” on the country entitled Rhapsody in Red: How Classical Music Became Chinese. For me, there is another type of nostalgia associated this release – a memory of when communist governments, despite their restrictions on freedom of expression, still considered excellence in culture to be a central mission of the government. It is not a time to which I would wish to return, but it did leave us some monumental cultural achievements.